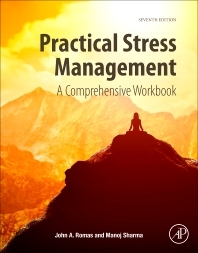 Practical Stress Management: A Comprehensive Workbook, Seventh Edition, is a focused, personal, worksheet-based text that combines theory and principles with hands-on exercises to help readers manage the negative impact of stress in life. As a practical tool for recognizing and preventing stress, the action-oriented approach enables the student to make personal change through self-reflection and behavior change techniques. This approach allows the book to be used as a text in a course or as a self-study/reference book. In this edition, the authors cover financial stress and expand their section on sleep. The book is accompanied by online MP3 files of guided relaxation techniques and downloadable worksheets. In addition, worksheets and thoughts for reflection boxes help users determine their own level of stress and apply effective stress management techniques. Dr. John A. Romas is currently a Management and Health Consultant/ Professional Counselor. He is professor emeritus and was former department chair within the Department of Health Science, Minnesota State University, Mankato. In addition to his background and experience in health education and promotion, Dr. Romas has expertise in counseling/ clinical psychology and career development. He has worked as a public school teacher/administrator, public health administrator/ educator, state health consultant, and small business manager. He has been a well-known speaker, presenter and health consultant for health care settings, educational organizations, government, business, and industry in the areas of personal performance, stress reduction, managing change, and health promotion. He is a former Licensed Professional Counselor with the State of Minnesota Board of Behavioral Health. Currently, he lives in Las Vegas, NV with his wife Judi, a former kindergarten teacher and two Puggle canines. They have one grown daughter, a professional performer-dancer, choreographer, model, and director-producer of her own stage show in Las Vegas. Manoj Sharma, MBBS, MCHES, Ph.D. is a physician by initial training and completed his Ph.D. in Preventive Medicine from the College of Public Health at The Ohio State University in 1997. He is currently a tenured Full Professor in Behavioral & Environmental Health at the Jackson State University in the School of Public Health. He has taught a variety of undergraduate and graduate courses in health behavior, health education, and health promotion in his career at eight different universities working as full-time or part-time faculty. He is a prolific researcher and as of February 2017 has published nine books, 180 peer-reviewed research articles, and over 350 other publications. He has worked on professional projects in 14 countries. His research interests are in developing and evaluating theory-based health behavior change interventions, community-based participatory research, and integrative mind-body interventions.